As part of the UK-Russia Year of Language and Literature the British Council has prepared a large program of events celebrating the 400th anniversary of Shakespeare’s death. On April 21, Moscow’s Tretyakov Gallery saw the opening of the exhibition Elizabeth to Victoria: British Portraits from the Collection of the National Portrait Gallery. Among the legendary portraits on display are images of Shakespeare, Isaac Newton, Charles Dickens, Elizabeth I and many more famous Britons. The exhibition is a part of the high-profile exchange of portraits between Russia's and UK main art galleries. The Russia and the Arts exhibition from the collection of the Tretyakov Gallery opened in London in March and has even been advertised on the London Underground. This exchange of art masterpieces is devoted to the 160th anniversaries of both galleries, as well as to the UK-Russia Year of Language and Literature, since many of the paintings featured on both sides are portraits of Russian and British writers. The Year in its turn also coincides with the 400th anniversary of the death of Shakespeare. To mark the occasion, the British Council, the organization that promotes British culture worldwide, has scheduled several large-scale events in Russia devoted to the Bard. “Shakespeare is a key figure in both British and Russian cultures: He's both an enduring inspiration and something we share, that why's he's at the heart of the UK-Russia Year of Language and Literature in 2016,” said Doug Wallace, creative director of the UK-Russia Year of Language and Literature. Alongside the exhibition, an educational program is planned for Muscovites: a series of lectures by British and Russian curators, writers, scientists. The topics range from Shakespeare to Darwinian theory and the political satire of William Hogarth and Laurence Sterne. "Shakespeare’s anniversary will be commemorated around the world, but nowhere will it have more resonance than in Russia, where Shakespeare, because of his influence on Russian writers, is practically a Russian writer himself,” said Michael Bird, director of the British Council in Russia. Moscow and St. Petersburg cinemas will host live broadcasts of the Shakespeare Live! festival from the UK, which will feature performances from well-known actors, musicians, orchestras, as well as the Globe Theater and the Royal Opera. The first broadcast will be screened on April 23 at Moscow’s Praga movie theater and will feature a special gala in Stratford-upon-Avon, birthplace of Shakespeare. "This once-in-a-lifetime event celebrates Shakespeare’s place and his enduring influence on literature, music, theatre, comedy and opera," reads the website of the British Council. The full program of Shakespeare Live is available on www.bbc.co.uk/shakespearelives. From April 23 till June 30 passengers at Moscow’s Domodedovo airport will be able to enjoy a photo exhibition titled “Shakespeare Lives at Domodedovo” in the check-in zone on the ground floor. The curators of the exhibition decided to reinterpret Shakespeare’s life through the prism of the contemporary world. Photos from different countries depict scenes from his plays in a unusual context. Teachers across Russia are invited to join Shakespeare Day and conduct a lesson dedicated to the great playwright. All participating educators have a chance to take part in the competition for the best plan of a Shakespearean lesson (in any discipline) and win one of three trips to the UK in summer 2016. This is an initiative of the British Council and the Russian Education and Science Ministry. The competition is a part of Shakespeariad – a series of events, lectures, creative challenges and competitions dedicated to Shakespeare as part of the Year of Language and Literature 2016. Meanwhile, for those who want to improve their English there is a free online course called Exploring English: Shakespeare. The creative team behind the UK-Russia Year of Language and Literature and the British Council are inviting Russian translators to take part in a competition and translate into Russian 12 works by British writers that haven't been translated yet. The contest starts on April 25, and the deadline for applications is Sept. 1. All the works will be assessed by the Russian Institute of Translation, and the winners will be announced at the Non-Fiction book fair in Moscow in November. Terms and conditions will be available online from April 25. The Russian educational project Arzamas launches an online course devoted to Shakespeare on April 28. Video lectures by renowned theater and literature experts, quizzes and plays will reveal all the myths about the Bard and his plays, as well as their theatrical interpretations during his life and after his death. Meanwhile, smartphone users will also be able to get in on the action – a new app called Emoji Shakespeare, which will allow users to “smile” like the Bard, will soon be available in the App Store and Google Play. 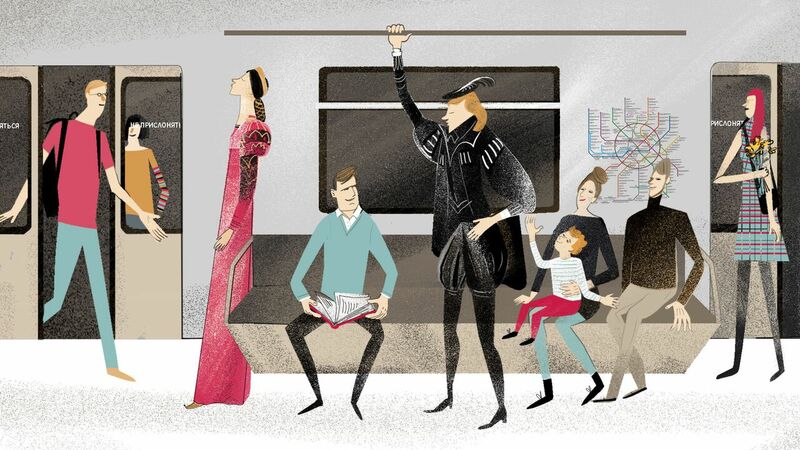 According to Doug Wallace, a special Shakespeare train featuring quotes and images of the Bard is planned to be launched on the Moscow metro this spring. Find more information on www.britishcouncil.ru.